Botany provides an introduction to the living world: the diversity of its organisms, its historical origins through evolution, its principles of structure, function, and ecology, and its interactions with the nonliving world. Through photosynthesis plants fuel all other life on earth. They are the primary producers of the living world, also driving global water and carbon cycles. In keeping with the tradition of botany departments, our program covers plants and algae as well as fungi and bacteria – all living organisms except animals. 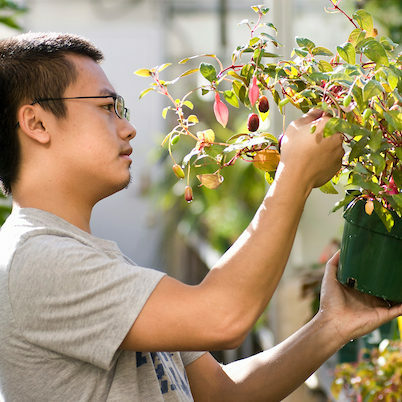 The undergraduate program in Botany leads to the Bachelor of Arts or Bachelors of Science degrees. Why choose a Botany major? Learn from the experts: Members of the Botany faculty are authorities in aspects of plant biology ranging from molecular functions in cells to behavior of ecosystems. They teach the introductory biology courses required of Botany majors as well as the upper level courses focused on more specific topics. Access to faculty: The number of declared Botany majors rarely exceeds 40 students. This relatively small number enables a high degree of interaction with the faculty. The Botany faculty adopted the Undergraduate Learning Goals in May 2015. Read them here.